Leonardo da Vinci's early 1500s masterpiece Mona Lisa is one of the most beguiling and recognisable works in the history of art. 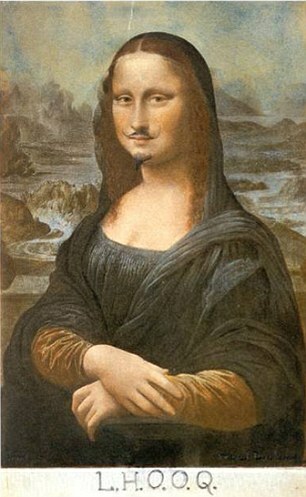 Over the years her fame has meant that she has been parodied many times - including when Dada artist Marcel Duchamp gave her a moustache. 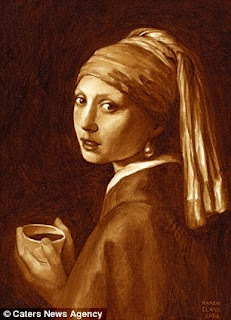 But now American artist and caffeine-lover Karen Eland has modernised the image... by creating a copy of the Mona Lisa with coffee. On this occasion, the sitter is also handed a cup of the warm energy-boosting drink - so in fact she should be renamed the Mocha Lisa! 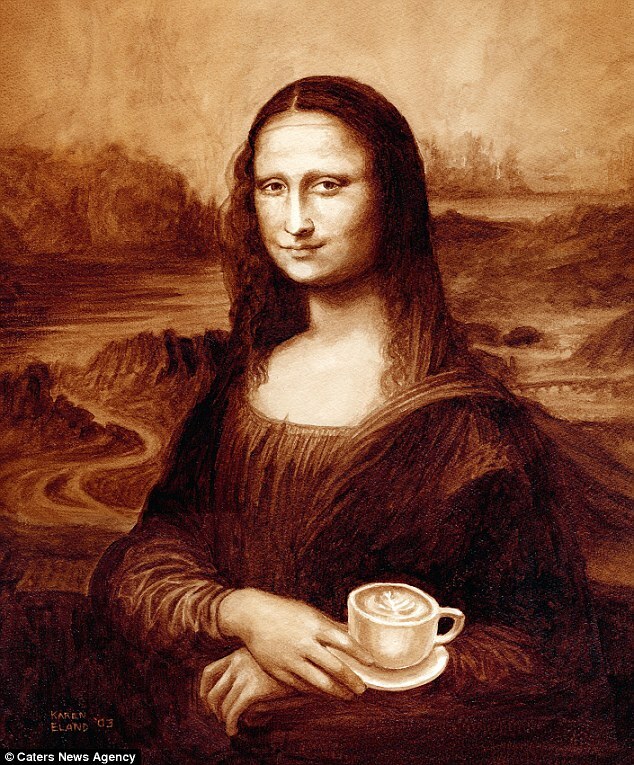 Da Vinici's picture is not the only artwork that has been recreated by Eland and her coffee beans, though it is not the first time Mona Lisa has been linked with caffeine. In 2009, at an Australian festival called the Rocks Aroma in Sydney Harbour, 4,000 cups of coffee - lattes, long blacks and flat whites - were used to parody the masterpiece. 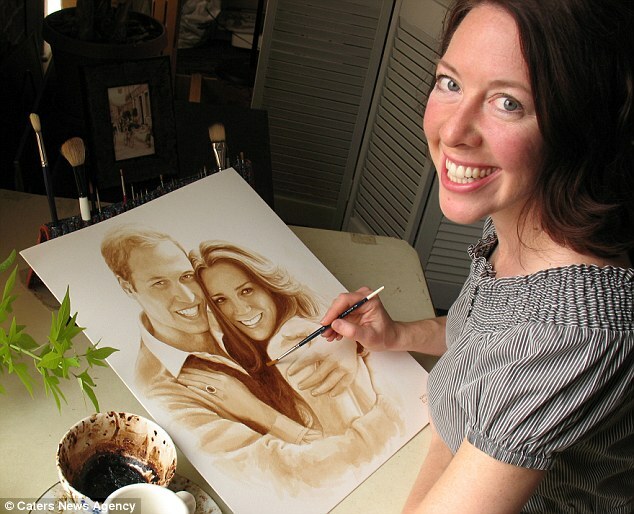 But some other coffee paintings created by 38-year-old Eland include Prince William and Kate Middleton's famous engagement portrait and Vincent van Gogh's Cafe Terrace. Eland spends hours painstakingly crafting the drawings, with her largest - a 20ft mural - taking a staggering seven months. A lot of coffee helped her through that one! She uses nothing but espresso shots straight out of the machine, mixes them with water and then paints just like you would a watercolour. And then she layers the coffee 'paint' to create darker and lighter shades - and has to keep the paper lying flat to prevent it from running. The artist, from Bend in Oregon, said: 'I do love coffee. I actually became a barista after coffee painting, and have worked at several shops very passionately. 'It all started in 1998 when I was sitting in a coffee shop in Tulsa, Oklahoma, painting a watercolour. 'I kept staring at the beautiful brown of the espresso shots as they came from the machine, thinking how coffee stains things, and perhaps I could paint with it. 'I mentioned it to the barista, who said I should try, and right then coffee art was born. 'I tried using grounds but it turned out the straight espresso worked best. 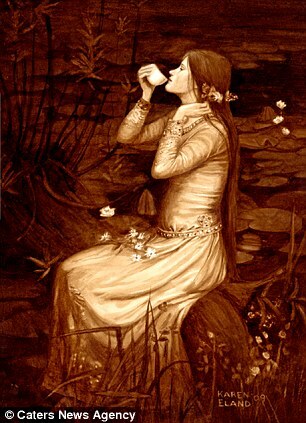 The professional artist, who has sold works for up to $15,000, includes a coffee cup in each painting. She added: 'Most people at first think it's called coffee art just because they see how I've included a coffee cup in the picture. 'When they finally realise it's painted using only coffee, their eyes get big and they say "really? ".